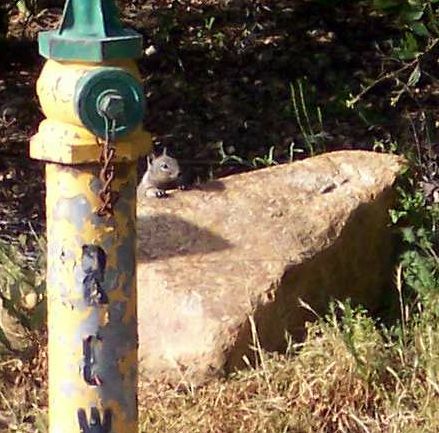 Ground squirrels are a common sight at the Santa Rosa Plateau, and are often seen near the Visitor Center, especially on top of the boulders there. 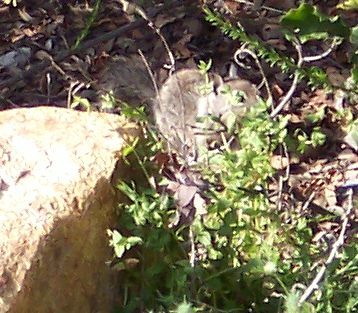 Rick Bramhall, in Wild Mammals of the Santa Rosa Plateau (2003), gives the following information: Baby squirrels are usually born in late April or early May, typically in a litter of 6-7, and don't open their eyes until 33-39 days after birth. At about 4-6 weeks of age, they first poke their heads out of their burrows. In another four weeks, they begin to go off on their own. 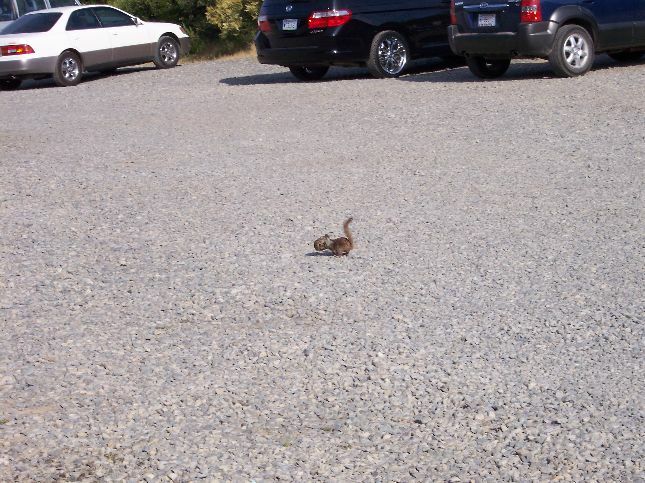 On Memorial Day, 5/30/05, I was lucky to witness a mother squirrel moving her babies one by one from one side of the Visitor Center Parking lot to the island of vegetation in the middle of the parking lot. A young visitor asked me to identify a huge dandelion seed-head he had seen, which I identified as a grand mountain dandelion, Agoseris grandiflora, after he told me whether the seed head was white or gray. As we were talking about the plant, the young visitor noticed the squirrel with a mouthful of what looked like an animal. 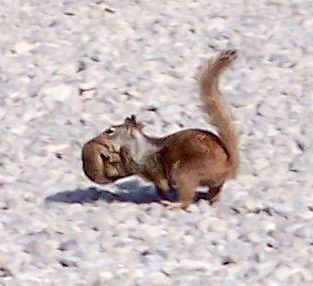 Since it is unusual to see a squirrel with animal prey, we were quite curious what it had in its mouth. The answer was soon coming. 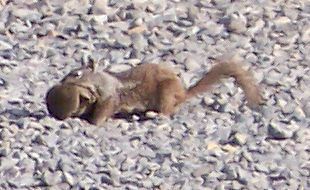 The squirrel deposited its mouthful in the island, then went back across the parking lot. Within minutes, it had its mouth full again, making the same journey. This time, though, it dropped its mouthful partway across the parking lot, which immediately scurried around the squirrel. It was a baby squirrel! Mom caught it quickly, and dropped this one off at the island as well. The above pictures were taken from a fair distance away, since I didn't want to frighten the squirrel. 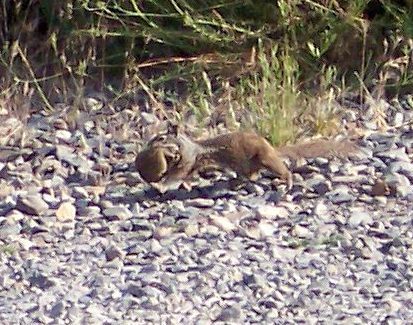 After I got those pictures, I went to the other side of the squirrel's path, where I could hide behind a car, but be closer to the squirrel. Even though the squirrel went back for the next baby, my patience gave out after 5-10 minutes. Perhaps she was having trouble with an unruly youngster that she was having a hard time corralling. Or perhaps she was bothered by a visitor who drove in, parked, then walked across her path. Mom! Mom! Where did you go? Perhaps she was like our cat when our cat had kittens. Our cat would regularly move the kittens around our house, hoping to move them to someplace where we wouldn't know where the kittens were. Perhaps it was time for the kids to be going off on their own, and the mom was moving them away from her territory.